The Washington Mystics will take on the Seattle Storm today at 3:30 in Game 2 of the WNBA Finals. The Mystics dropped the first game but if they win today, all will be forgiven. Rookie Ariel Atkins dropped 23 points on Friday night but that was about it as the Washington Mystics couldn’t get production from their two best scorers in Elena Delle Donne and Kristi Toliver. In Game 2, Seattle will try to go up 2-0 and put the Mystics on the brink of elimination while the Mystics look to tie the series and steal home-court advantage heading back to DC. Coach Thibault talked about the Mystics have to make adjustments for today’s game. But he said there’s a lot more to it than that. It wasn’t just on the offensive side of the ball where the Mystics didn’t look sharp, it was also on the defensive side of the ball. 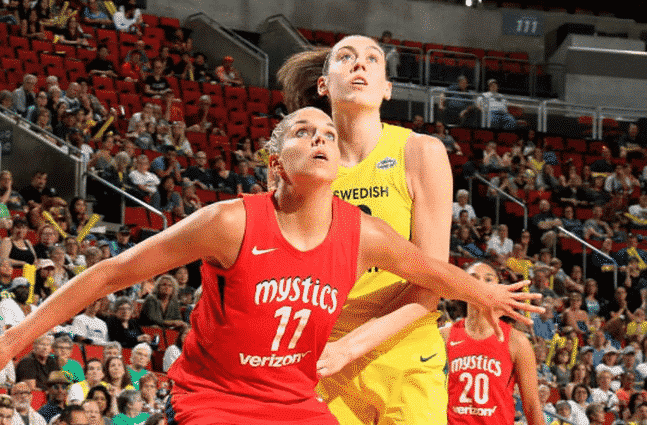 The Washington Mystics and their lackadaisical defending allowed the Storm to hit three-pointer after three-pointer and also allowed them to drive into the hole, sometimes even untouched on certain plays. While you have to give credit to the Seattle Storm for putting on a shooting clinic, the Washington Mystics did look like they were in quicksand for large chunks of the game. The Storm shot 54.7 percent from the field, with Jewell Loyd (23 points), Breanna Stewart (22) and Natasha Howard (19) leading the way. Sue Bird only had 4 points, but was able to set up her teammates throughout the game. Mystics will make adjustments on Sunday. While the Mystics may be the underdog in this series, no one expected the blowout that we saw in Game 1. Game 2 should be a much closer game with every mistake, every bucket, every block, every steal and every foul meaning a lot more than it did two nights ago. While I expect the Mystics to bounce back, they have to move the ball better as a team if they want to win. Too often they were left in the corner with nowhere to go and they have to be able to swing the ball around and try to draw fouls if it all comes to nothing. We know the Storm won’t let up and no one expects them to regress but if the Mystics can play the defense that they’re capable of playing, we could see the Storm shooters miss a little more and force them to take tough shots. Game 2 should be a heavyweight fight and the fans should be really excited about an excellent series.